Club Penguin Cheats by Mimo777 Club Penguin Cheats by Mimo777: Club Penguin Anniversary Party Still Here! you put a picture of your self and see your rank go up in popularity. I must say i didn't really like this years party. They didn't go so "all out" this year. Maybe because the Halloween party is coming up? i got the hat just in time! i got the hat then went up stairs and the the new yearbook and when i finished the pop art was gone so i went downstiars and it finished it stopped at 19:05 GMT time zone plz post thx. Do you mean for members? Well under your badge there stripes. When you get 3 stripes and a star your a RARE member. it is over i just saw it! Do you mean the who influnces you the most on the internet? Yeah it did that last year. i have never been to one EVER before! Did you use the big smile? The normal smile the stamp shows doesn't work. THANKS! 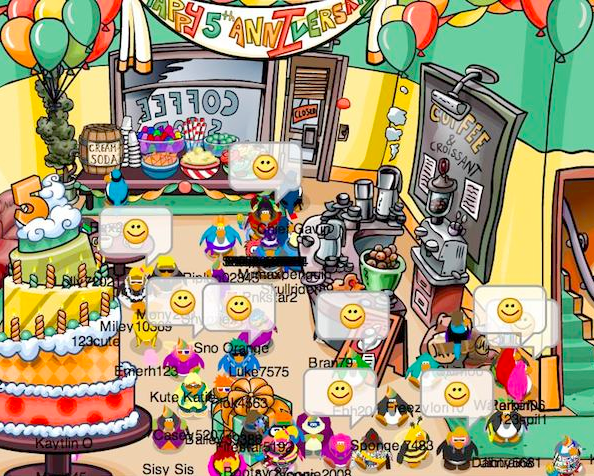 I was wondering why it wasnt working when i got ten penguins to smile! If you mean the "influence project" then I think mimo was the 1st in the cp or something. I don't know what he was overall. I agree! It was kinda lacking something. There's always next year. It's a shame you couldn't go! Too bad dude! Well there's always next year! Ahhh no. I missed the hat..... I have the 2nd year hat though. because it probably has to do with the fact that you can only earn them on that party. I'm glad you got the stamp in the end!